I came across this announcement and I couldn’t help feeling very proud. I have been visiting jazz concerts since I was very young. My father used to take me to Theater Pepijn in The Hague, De Tobbe in Voorburg and Thelonious in Rotterdam to see the jazz greats of that time. There were some people that we would go to see more often than others. Like Jarmo Hoogendijk or Ferdinand Povel. And the Rein de Graaff trio. For 25 years Rein has been organizing tours, performing with internationally renown artists. I have seen many impressive concerts throughout the years, starting from a very early age. Now you understand why it is that I feel so proud playing with Rein. Last year we did a short tour with flutist Sam Most, and now we get to play together again! Rein is celebrating his 70th birthday and his 25 year lustrum as an organizer. Other participants will be Houston Person(! ), Sylvia Droste, Benjamin Herman, Ben van Gelder, Martijn van Iterson, Marius Beets and Eric Ineke. The week after we play at the Bimhuis. It got confirmed today: November 25th there will be a tribute concert to celebrate the music of Irish pianist and conductor Noel Kelahan, who passed away last February. It’ll take place in the National Concert Hall in Dublin. I’m already looking forward! Last week I sent a news letter to all subscribers. I regularly send letters, mostly to inform people about concerts in their region (I wouldn’t want to bother people from the north of the country with small concerts in the south and vice versa). This time however I had some concerts on bigger festivals to announce and also other interesting things to tell. It’s amazing how many nice reactions I received! 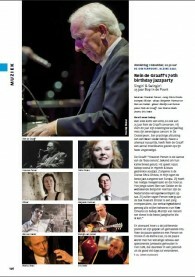 But – even more to my surprise – I got to be mentioned in the weekly jazz column of Bert Jansma in The Hagues regional quality paper Den Haag Centraal. Bert quotes more than a bit of the newsletter. For those who feel dissappointed not having received the letter: you can view it here (sorry, this one I only made in dutch). Interested in a subscription? Just click the button and let me know which concerts you would like to be informed on.